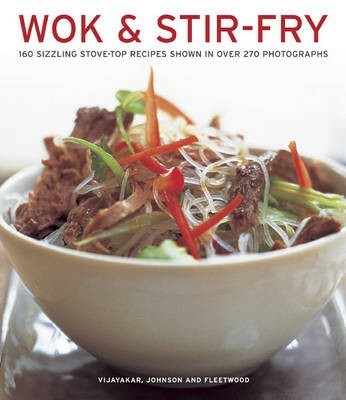 You can discover the amazing versatility of wok cooking, with this collection of more than 160 fresh and aromatic dishes. Every occasion is catered for, with recipes for Crispy Snacks and Finger Food; Soups and Appetizers; Poultry Dishes; Meat Dishes; Shellfish and Fish; Vegetable Main Dishes; Vegetables and Side Dishes; and even Sweet Dishes and Desserts. You can enjoy spicy snacks and appetizers such as Spiced Noodle Pancakes and Hot and Sour Soup, speedy sizzling main courses like Scented Chicken Wraps and Stir-fried Crispy Tofu, and even wok-fried desserts such as Sweet and Spicy Rice Fritters. It includes beautifully illustrated with 270 sensational photographs, each dish features a full nutritional analysis to make meal planning easy. Cooking with a wok is one of the simplest ways of making delicious food, and it is so versatile, it can be used for stir-frying, braising, steaming and deep-frying. This fantastic volume has over 160 recipes to suit every palate and occasion: try Chinese Crispy Five-spice Chicken, Steamed Mussels in Coconut Milk and Balinese Vegetable Soup. A guide to the equipment, cooking techniques and ingredients takes you from stir-frying and smoking to steaming rice and noodles, explaining all the ingredients, from tofu and meat to spices and sauces. This fully illustrated guide to wok cooking will guarantee great results every time.